Floods happen every day, and are caused by human or mechanical error. A human error is when accidentally a toilet, sink, or bathtub overflows, and a mechanical error is when the piping is old and a drain or sewage backs up or breaks. To prevent headaches, it’s important you hire a highly experienced company to effectively mitigate a property suffering a flood. For over 20 years, we have been helping property owners, strata councils, and insurance companies return properties to pre-loss condition with the highest level of professionalism and care. 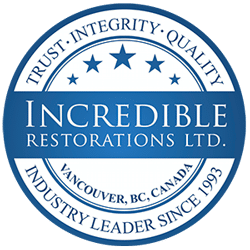 At Incredible Restorations, our technicians are trained professionals that can handle the extraction of clean or black water. We have the manpower, state-of-the-art equipment, and experience to efficiently mitigate a flood of any size. Our team of dedicated professionals handle large residential and commercial floods. Our culture is one of highly motivated water damage restoration technicians fully equipped with the latest industry tools and know-how to mitigate any size flood with the upmost level of care and professionalism.